The dashcam video has been watched almost half a million times in less than 24 hours and Islanders have been shocked at the actions of the driver. OnTheWight speaks to the police about what happens next. A dashcam video captured yesterday afternoon (Tuesday) whilst Jarv Stevenson was driving home from work on the Isle of Wight has been shared over 3,700 times on Facebook in the last 22 hours. 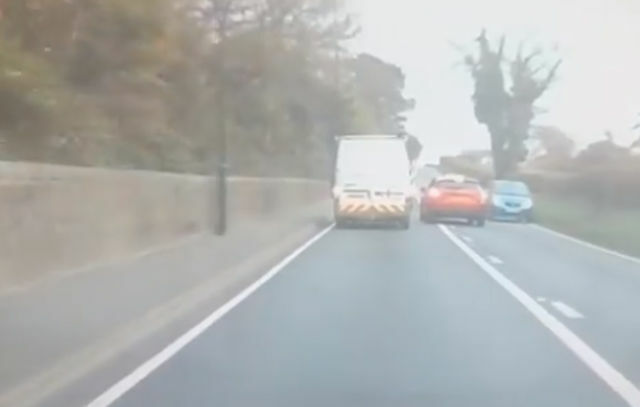 The footage – which has been viewed almost half a million times – shows the driver of a red Mazda make several attempts to overtake the vehicle ahead of them in what many people have described as a dangerous situation. The driver’s actions eventually forced oncoming traffic to swerve to the side of the road, to avoid a head-on collision. Many comments have pointed out that the car was also crossing the solid white line when it met the oncoming traffic. Many of those commenting on the video thread suggested the footage be reported to the police and at least one other says they witnessed the same car make equally dangerous maneuvers the previous week on the Racecourse Roundabout. “We received a report last night (Tuesday 19 March) that a vehicle, described as a red Mazda, had been driving dangerously on the A3054 in the Fishbourne area at around 4.50pm the same day. Language in the comments is strong, so would avoid looking at them if you are offended by strong language. 2 Comments on "Police investigating driver on dashcam video watched over half a million times"
Too busy riding around in their police cars! !